zend-component-installer, which helps automate injection of component configuration into your application. zend-mvc, the kernel for MVC applications. The default is to provide the minimum amount of dependencies necessary to run a zend-mvc application. However, you may have additional needs that you know at the outset, and, as such, the skeleton also ships with an installer plugin that will prompt you for a number of items. All prompts emitted by the installer provide the list of options available, and will specify the default option via a capital letter. Default values are used if the user presses "Enter" with no value. In the previous example, "Y" is the default. The developer toolbar provides an in-browser toolbar with timing and profiling information, and can be useful when debugging an application. For the purposes of the tutorial, however, we will not be using it; hit either "Enter", or "n" followed by "Enter". We will not be demonstrating caching in this tutorial, so either hit "Enter", or "n" followed by "Enter". This tutorial also uses zend-form, so we will again select "y" to install this; doing so emits a similar message to that used for zend-db. Once the installation is done, the skeleton installer removes itself, and the new application is ready to start! 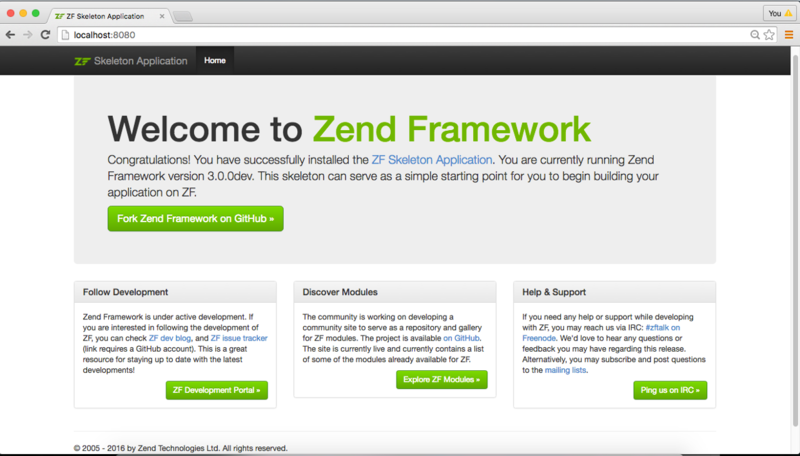 Another way to install the ZendSkeletonApplication is to use github to download a compressed archive. Go to https://github.com/zendframework/ZendSkeletonApplication, click the "Clone or download" button, and select "Download ZIP". This will download a file with a name like ZendSkeletonApplication-master.zip or similar. Unzip this file into the directory where you keep all your vhosts and rename the resultant directory to zf-tutorial. At this point, you will be prompted to answer questions as noted above. Via the PHP built-in web server. If you’ve done it right, you should see the following. PHP's built-in web server should be used for development only. The image uses Apache 2.4, and maps the host port 8080 to port 80 on the virtual machine. Docker containers wrap a piece of software and everything needed to run it, guaranteeing consistent operation regardless of the host environment; it is an alternative to virtual machines, as it runs as a layer on top of the host environment. docker-compose is a tool for automating configuration of containers and composing dependencies between them, such as volume storage, networking, etc. The configuration includes both PHP 7.0 and Apache 2.4, and maps the host port 8080 to port 80 of the container. We will not cover installing Apache, and will assume you already have it installed. We recommend installing Apache 2.4, and will only cover configuration for that version. You now need to create an Apache virtual host for the application and edit your hosts file so that http://zf-tutorial.localhost will serve index.php from the zf-tutorial/public/ directory. Setting up the virtual host is usually done within httpd.conf or extra/httpd-vhosts.conf. If you are using httpd-vhosts.conf, ensure that this file is included by your main httpd.conf file. Some Linux distributions (ex: Ubuntu) package Apache so that configuration files are stored in /etc/apache2 and create one file per virtual host inside folder /etc/apache2/sites-enabled. In this case, you would place the virtual host block below into the file /etc/apache2/sites-enabled/zf-tutorial. Make sure that you update your /etc/hosts or c:\windows\system32\drivers\etc\hosts file so that zf-tutorial.localhost is mapped to 127.0.0.1. The website can then be accessed using http://zf-tutorial.localhost. If you've done so correctly, you will get the same results as covered under the PHP built-in web server. To test that your .htaccess file is working, navigate to http://zf-tutorial.localhost/1234, and you should see the 404 page as noted earlier. If you see a standard Apache 404 error, then you need to fix your .htaccess usage before continuing. You should never enable development mode in production, as the typical reason to enable it is to enable debugging! As noted, the artifacts generated by enabling development mode cannot be committed to your repository, so assuming you don't run the command in production, you should be safe.